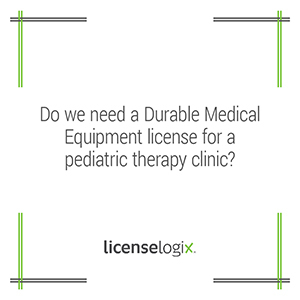 Do we need a DME license for a pediatric therapy clinic? Identify the potential licenses that your business might require in every relevant jurisdiction. Obtain for you all the necessary application forms and compile a list of required supporting documents. Produce a comprehensive report for your records containing forms, filing information, and state fees. Once you receive your license research packet with all of the applications you need, you can choose to fill them out yourself or have LicenseLogix complete the license filings for you. To get started you will be assigned an account manager who will handle your licenses from start to finish. For more information on LicenseLogix services and how we can streamline business licensing for you please contact us by clicking our live chat function, submitting a question to our licensing team or simply call us at (800) 292-0909.